On my next attempt, i got kind of busy and ended up letting it sit for closer to 24 hours. It didn't turn out as well - seemed to have an unpleasant edge to the taste and the texture wasn't as nice, probably because of the over-fermenting. So... if you're lazy, but like the taste of homemade bread, this might be the recipe for you. I traveled up to Cambridge Bay for a five day visit this past week, with a night in Yellowknife both ways. En route, we stopped over in Rankin Inlet... so, I got to see a bit more of the North. Moving on to Yellowknife, it was nice to be south of the treeline again. With a population of around 20,000, Yellowknife sits on the north shore of Great Slave Lake and is the capital city of the Northwest Territory. Besides the government activity, the city's growth is fed by local diamond mines, including De Beer's new Snap Lake Diamond Mine. Yellowknife was warm - humid even, in the 20s. 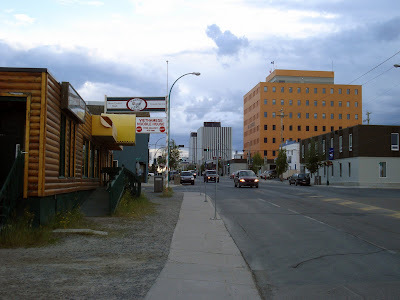 ... and, of course, no visit to Yellowknife would be complete without taking in some of the historic landmarks, like the Wildcat Cafe: ...and the notorious Gold Range Hotel: I managed to fit in an evening at the Gold Range, sampling some of the local culture and entertainment. The decor and ambience is vintage "Northern Tavern". 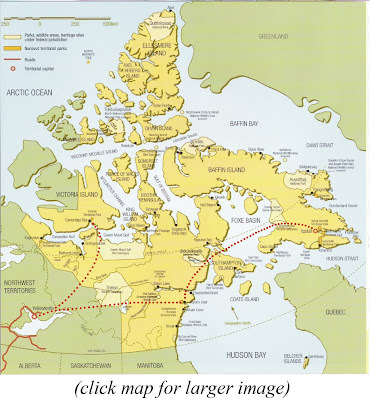 The hamlet of Cambridge Bay sits on the last leg of the fabled Northwest Passage - Franklin never quite made it that far; his ship ended it's journey in the ice pack surrounding nearby King William Island and from there he and his crew struck out on their final ill-fated attempt to save themselves by traveling overland. There was a low ceiling of clouds over Cambridge Bay when our plane landed - they send up balloons and time how long it takes for them to disappear from sight to determine the height of the cloud cover and whether or not it's safe to land. Rain and cold wind greeted me in Cambay (as the locals as the locals sometimes refer to it)... and, of course, the local mosquito committee. The hamlet is situated well above the arctic circle and even in the end of July there was only maybe an hour or two of darkness/twilight - as was confirmed to me when I woke up at 4:30am the first night with the sun beating down through the bedroom window at me. My hosts graciously allowed me the use of an ATV while I was there and it was great fun to go tooling around the town and countryside. The ATV is even more prevalent as everyday transportation than in Iqaluit; I'd guess that the auto to ATV ratio is about 1:1. There is a stark beauty to the place with its vast expanses of barren tundra where the pure colours of sky, water, soil and rock are unchallenged by distraction. When I first arrived, ice still clung to the shoreline of the bay; a couple of days later it had disappeared. This radar station was part of the Defense Early Warning ("DEW") Line that the Americans set up during the cold war. It is now part of the North Warning System. My Inuk friend, Josephee, makes a variety of implements and tools in his shed down by the shore. Josephee works pretty well exclusively with hand tools. I've been watching him making Ulus - knives used traditionally by women to cut meat, skin, and anything else they need to. My mom had warned me in the past that she thought I was on this road... and now, I guess it's official. 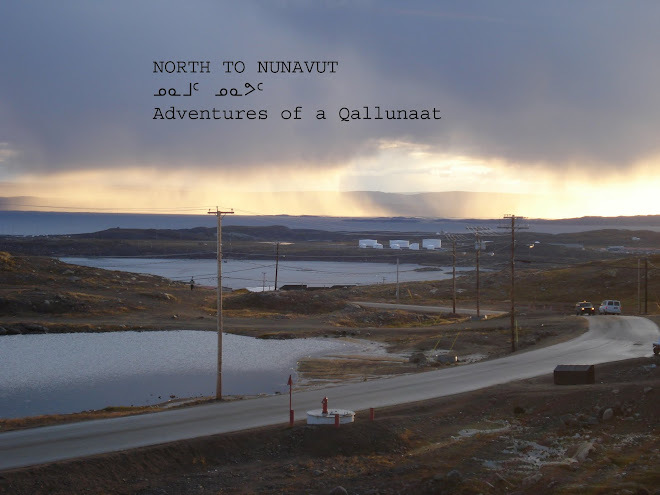 But it appeared the situation was even more dire - this past week, I attended at the Iqaluit Post Office to get my new post office box. The fellow behind the counter shuffled through some papers and then glanced up at me and asked "are you superstitious?" "No.." I replied. "Good - because I'm assigning you box 666; I'll go get the key". I considered this as he went into the back room. Geez... my address will be P.O. Box 666, The Road to Nowhere... that can't be good. I must confess to a bit of relief when he returned and advised me that somebody else had taken that number and he assigned me another. Sealift started this week - this is the annual summer arrival of ships with cargo which people have ordered in - a lot cheaper than the fall/winter/spring airfreight method. The discerning Iqaluit shopper will order a years supply of staple goods (flour, sugar, canned goods, toothpaste, etc.) from southern stores like Costco and ship them up at this time. It is also the time when big-ticket items, like SUVs, ATVs and snowmobiles are shipped in. When I first heard of this practice, I had the naive idea of a bunch of cargo vessels arriving at once with the townspeople huddling together on the shore eagerly awaiting their goods (followed, no doubt, by a huge celebration - almost like harvest time). The reality is not quite like that... for one thing, I didn't take the tides into consideration. The tides vary from day to day and it takes time for the cargo shuttles to reach shore from the ship. Some of the differences I've noticed between life in Iqaluit and life in London, Ontario: For one thing, road vehicles stop to let you cross wherever you want to. Another is taxicabs - they charge per-person ($6.00 anywhere) and will pick up other fares on the way. You don't give them a street name, just a building number. Cabbies make good money up here and bar staff can make 50K a just in tips. Another thing is alcohol - the only place you can buy booze is at a bar - no takeout. So... if you like to have wine with your meals, as I do, it seems you have to either order from a limited selection which is flown in from Rankin Inlet, or get a government import licence and ship it up from down south - both options at a greatly inflated cost.